If you drive by our house between the hours of 6PM and 9PM you may think we just won a free vacation. We are a dance party family. And I used to dance with them. But then a few months ago I saw a video Lance took of me dancing with the girls. Instead of noticing the joy in their faces or the fun we appeared to be having– I only saw several extra pounds dancing around my 5 ft. frame. You see, you can easily hide extra fluff with skinny jeans and long cardigan. But very little is hidden when you’re doing the lawn mower in grey yoga pants. Nothing, actually. The moment that I saw what I thought everyone else was seeing was the moment I vowed to stop dancing with such abandon, even in my own home. Basically I told myself, No more freedom for me, at least not in front of the camera. I kept it to myself and silently loathed the comfort I had in my own skin. No harm, no foul, I could just be the one behind the camera capturing their antics. What?!!! I thought, Yes I do!!!! We dance all the time!! My stomach lurched as I realized an inconvenient truth. We don’t. They do. I’m the one clearing dishes and smiling from across the room. And even though it’s only been a few months, that is a lifetime to a six-year old. I know exactly the moment I became someone who stopped having as much fun as everybody else because I didn’t like the way I looked on video. That kind of self-shaming is the worst possible lesson I could teach my beautiful daughters. And it ends now. I may drag myself out of bed multiple days a week for spin class but it isn’t to punish myself for last week’s pizza. It’s because I only have one body and it’s my responsibility honor to keep it as healthy as possible. I track my water intake and eat from the outer edges of the grocery store because it’s GOOD for me. Shaking my head every time I look in the mirror is not good for me. Ironically, the words Free Indeed hang on our living room wall. Can I ask you the same question I’ve been asking myself? Are you Free? Are you living in that Freedom? Because if you are, fight against anything that would take away that freedom that Christ Himself has given you. If you are free, STAY FREE. Don’t let what someone else does, says, or looks like take away the freedom that you have been given to be yourself fully. I’m really not a very good dancer. It’s a bit of a cross between Phoebe Buffay running and Carlton Banks doing his thing… but I’m ok with that. Why? Because it’s fun. So I’m dancing now. Every single chance I get. Of all the things I want my girls to see my doing, it is living free. As tempting as it is to restrain myself to residing only in flattering positions… to wait until all of the good choices finally pay off a little bit, it’s simply not worth the sacrifice. 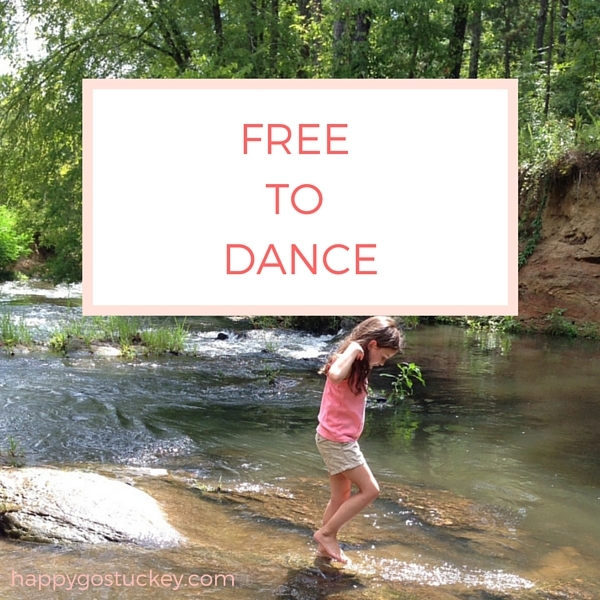 Waiting to dance with my children and the man I love is not worth the sacrifice. And frankly it is a sacrifice that I choose not to make. It’s not about guilt or self-awareness or pretending to be something we’re not. It’s about the freedom we already have. It’s not about guilt or self-awareness or pretending to be something we’re not. It’s about the freedom we already have. Live Free, friends. Let’s live free together. After all, who will teach our children how to do the sprinkler if we don’t? Iced Coffee. Simple & Perfect. Love this. I struggle with the extra pounds I’ve put on in the last year or do, due primarily to health issues. And yet, I see photos of women heavier than me who look do happy and confident. I had the same “aha” moment as you, when I realized that I’m missing out on the joy God wants me to have, by being so self-conscious and self-critical. Thanks for the reminder to live free of self condemnation and enjoy that freedom we have in Christ instead!